Drake says: "Carcassonne - The Discovery is a stand-alone expansion to Carcassonne the board game. As in the original game, tiles are placed so that identical landscape types match up. When followers are removed, the size of the region in which the follower is located brings points - regardless of whether the region has been closed off or not. There's also an additional rule that allows incomplete mountainous regions increase in value. 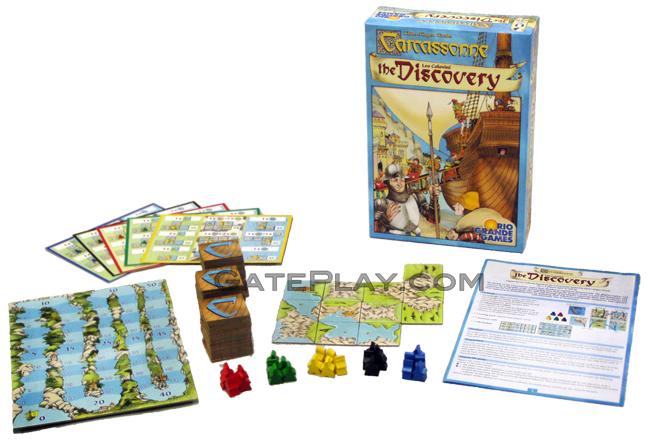 The Discovery is a welcome expansion as it brings new challenges and strategies to this popular game series." John says: "This version of Carcassonne has simpler rules than the original, but offers greater strategic depth. This is considered my many to be the best Carcassonne expansion." The people of the Carcassonne region have decided to expand to distant lands. The players explore and discover the geography of the surrounding area, facing the dangers of the sea and the mountains and exploring the vast grasslands. The skill and strategy of the players exploring these new territories and their approach to controlling them by deploying their followers as brigands, navigators, and explorers will determine who is victorious. 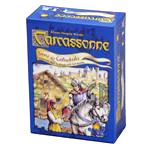 Check out "Carcassonne - The Discovery" on BoardGameGeek.com! Check out "Carcassonne - The Discovery" on KidGameRatings.com!